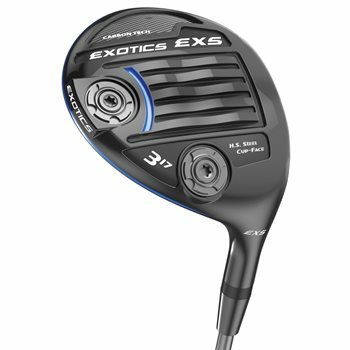 The EXOTICS EXS Fairway features a Flight Tuning System (FTS) that includes Cup Face Technology with Face Thickness (VFT Technology) for an expanded sweet spot. As well as a new and improved SlipSystem Sole for a faster clubhead speed through the turf. Also includes a multi-material usage of Carbon Fiber for an ideal weight distribution. Carbon Fiber Toe creates extreme weight savings re-distributed to optimized positions creating extremely high MOI. U.S. Carpenter Steel Cup Face quench-hardened high-density steel made thinner for to-the-limit COR. Variable Face Thickness delivers legendary Exotics power from more contact points on the face.